When it comes to fidget spinners, there is no doubt that you are spoilt for choice. Since these tools have grown in popularity, it may seem that every retailer is offering them. Now, you may have realized by now that not all of these objects are created equal. While there are some fidget spinners that live up to their claims, there are far too many that aren’t all that great to use. If you are having a tough time deciding which one you should actually spend your money on, your problems are over. We have put together a little buying guide that will help you find the best fidget spinners available. In many instances, people frown upon both adults and children playing with their fidget spinners. In these cases, you need a tool that is small and discreet but still offers up enough of spinning fun to help keep your fingers busy. Well, you will find that the Meecoo Fidget Spinner toy meets all of these needs. It is so small that it can fit and rest on the tip of your finger. At the same time, it spins quite well and continues for at least two minutes at a time. One thing that stands out about this object are the materials that have been used. It is made of brass and premium titanium. Not only does this make this spinner incredibly durable, it also means that you don’t have to worry about corrosion or toxins. Due to CNC machining, it has also been constructed quite precisely. Now, despite all of this meticulousness, there is one main flaw in this fidget spinner – the larger feel tends to become unbalanced. This throws off the whole momentum of the toy. You should also note that due to the size of the spinner, it really isn’t suitable for young children. 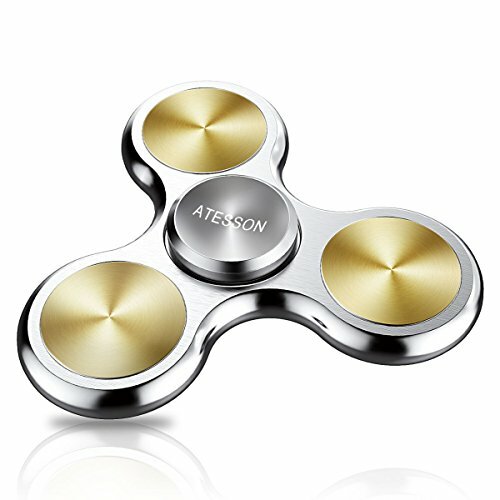 The ATESSON fidget spinner is a good reminder that these aren’t just toys for children – adults can get a lot of use of them as well. This is certainly a sophisticated looking spinner that you will not feel shy to carry around in your pocket with you. It is made of high-quality aluminum and relies on a stainless steel bearing to keep spinning properly. It has also been constructed using the latest technology which is what gives this spinner such balance and precision. Perhaps what is most impressive about this fidget spinner is how long it can spin without requiring any intervention from you. You can actually expect up to 10 minutes of spinning time! Of course, this does mean that the spinner is a bit heavy if it is supposed to manage such spinning times. So, it can feel a little cumbersome in your pocket or even when using it in your hand. Now, this spinner does have a beautifully polished exterior which is what makes it look so good. At the same time, the surface is easily scratched so you will need to be careful with it if you don’t want to scuff it in any way. 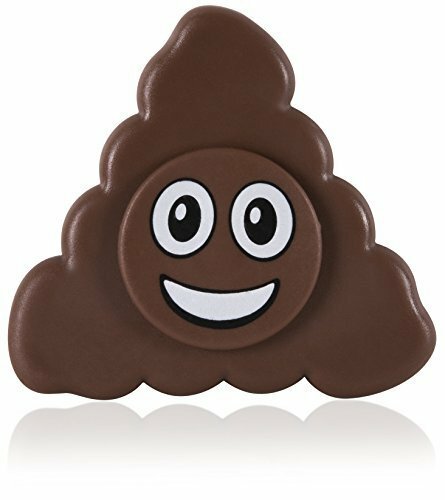 Let’s face it, there are few things that amuse children more than poop emojis. So, why not combine this with their favorite toy, the fidget spinner? If you are looking for a toy that is going to prompt giggles every time that it is used, then this is the one for your child. Without a doubt, all of their friends are going to want one too. The fidget spinner is made of plastic and is quite lightweight so you will be pleased to know that your little one can’t actually do a lot of damage with it. The toy does spin quite fast so it will keep your kid occupied for quite a while. However, because it is so light, it doesn’t spin for as long as you may want it to. Now, it is made from good, solid materials and certainly doesn’t feel flimsy at all. That being said, there is some apprehension about just how long this spinner will last, especially if it is used quite a lot or dropped. Fortunately, the price makes it a bit more of an affordable option for parents. What really makes this fidget spinner stand out is the attention to detail that has been applied to it. For instance, it is equipped with a high-performance steel bearing that has been specially lubricated so that you get to enjoy the smoothest spinning action possible. It also ensures that corrosion and bearing failure are unlikely to occur as well. There is also a protective cover to make certain that the bearing doesn’t shift out of its position or fall out while you are using it. As an added bonus, this is also a spinner that looks really cool and is great for people of all ages. As far as looks and performance go, there is no denying that this is definitely one of the best fidget spinners on the market. This doesn’t mean, however, that this spinner doesn’t have its own flaws. One of the top complaints is that it has a tendency to slow down with time. It also doesn’t spin as long as some of the other spinners out there. Fortunately, the manufacturer does offer an excellent warranty so if you do encounter any issues, you should be able to sort them out. Do you want to dive into the fidget spinner craze like everyone else but don’t actually want to spend too much money? Well, the good news is that we have come across a spinner that works beautifully and actually doesn’t cost all that much. 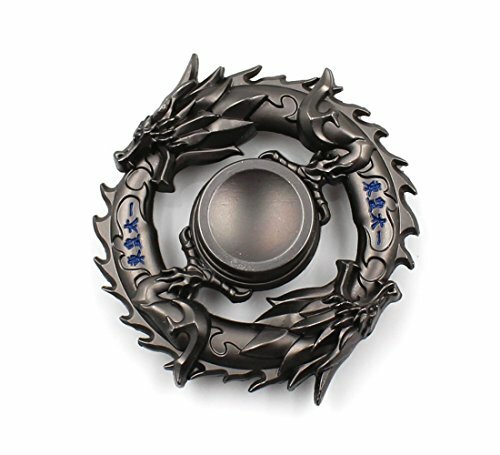 This is definitely a spinner that will catch your eye with its cool design. The two dragons are definitely a good choice for anyone who is looking for something a little different. Also, despite the price, the fidget spinner feels solid in your hand which lets you know that it is made from durable materials. The spinning motion is smooth and you can expect this spinner to rotate for at least several minutes at a time. This is quite an impressive duration for a spinner that is within this price range. While this functions perfectly well, you do have to wonder about the build quality. While the materials are good, the mechanism holding the bearings and the frame in place is a little bit more questionable. Because of this, it is difficult to tell just how long the spinner will last. Now, the other thing to be concerned about is the spikes on the dragon’s back. If the spinner picks up speed, these can be painful so it may not be all that suitable for a child. Despite these minor flaws, it is definitely the best cheap fidget spinner available. When you think about it, just how much do you know about fidget spinners beyond how to use them? The answer is probably not much. So, if you are in the market for a fidget spinner, here are a few things that you will need to consider. Fidget spinners aren’t actually classified as types. That being said, there are a variety of ways that one set of these toys can differ from others. For instance, some people choose to categorize them according to the number of spinning sides or arms that they have. These are known as the single bar, tri spinners, or quad bar spinners. Out of all the types, the tri spinners tend to be the most popular. Others like to differentiate the spinners depending on the ball bearings and what they are made of. The most common types of ball bearings are constructed from stainless steel, ceramic hybrid, or full ceramic. The ball bearing often determines just how smoothly the fidget spinner will spin in your hand. There are basically three types of materials that your fidget spinner made be made from. These are plastic, metal, and wood. Typically, the plastic frames are the cheapest but you may find that they don’t spin all that smoothly due to being poorly machined. However, these are unlikely to have any scratches or scuff marks should you drop them. Metal spinners are also quite popular as they look good and usually are more durable. The higher-quality spinners tend to have precision cutting which allows them to spin around very smoothly. Of course, these spinners do have a tendency to get scratched or scuffed after a while. Now, you don’t actually come across too many wooden fidget spinners. They fall within the same price range as the metal spinners, and as long as they are well-designed, you should be able to enjoy a smooth, spinning sensation. So, yes, ball bearings can be made from several materials. Nonetheless, when it comes to the spinning motion of the gadget, what is most important is the center axis bearing. Stainless steel bearings offer up a more cost-effective option than other types of bearings. They are also rather quiet and provide a smooth motion. Unfortunately, there is a limit to the number of spins that you can coax out of this bearing. So, you will find that you can’t spin them for minutes at a time. On the other end of the spectrum, there are ceramic bearings. These tend to be a bit more expensive although they are hard to beat in terms of smooth spinning motion and the number of revolutions. Where the ceramic bearings fall short is durability, as they can break rather easily when they are dropped. Due to this, they aren’t all that suitable for children. Finally, you have ceramic hybrids offer you the best of both bearing worlds. Unfortunately, this also means that it carries many flaws, such as the ability to become magnetized and a louder noise. Last but not least, you will need to think about the design of the spinner. This is because, these days, you will often find a great deal of options to choose from. However, it is important that you keep the function in mind when choosing the design. After all, certain shapes and sizes could end up limiting the spin speed or its continuous loop. For the sake of safety, comfort, and proper function, you should look for spinners that have a smoother, more rounded design. Spinning Duration: the first thing to look at is just how many rotations the spinner can manage after you have manually spun it. Usually, you will find that most spinners can manage anywhere from a minute all the way up to around ten minutes. Noise: the last thing that you want to do is to alert anyone to the fact that you are using a fidget spinner. This is why you should consider one that makes as little noise as possible when you are spinning it. If you like to keep the spinner on tabletops, you should look for designs that don’t vibrate too much. 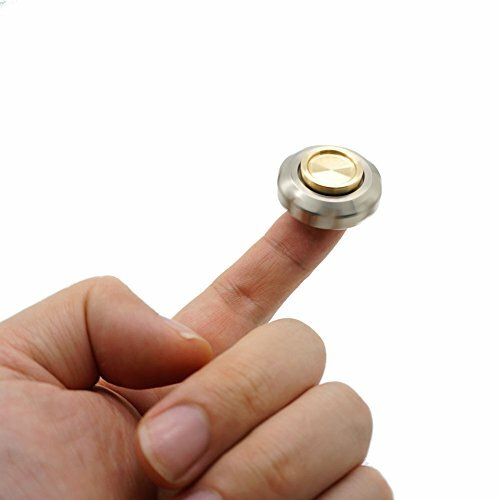 Size: typically, it is best to opt for a fidget spinner that is slightly on the smaller side. This makes it a lot easier for you to carry it around with you. On top of this, you will also find that it fits better between your fingers and that it will not slip out while you are using it. As you can see, there are a number of factors to consider when buying a fidget spinner. This includes aspects such as design, ball bearings, materials, and shape. If you heed the guidelines mentioned here, you should have no trouble at all finding one that is just right for you. 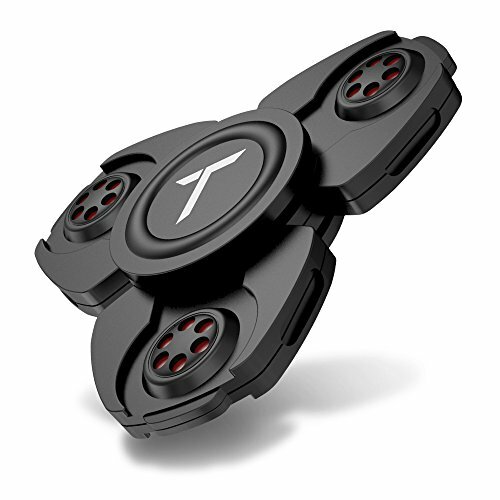 In case you are looking for a durable design that will last a long time, then the Trianium fidget spinner is an excellent choice for you. On the other hand, if you are looking for a longer spinning action, the ATESSON fidget spinner. For something quite amusing and perfect for children, you will find that the Kangaroo’s Emoji spinner can meet the mark. Of course, for a more discreet design, consider the Meecoo fidget spinner. If you are trying to keep the cost down, you will find that the MTELE fidget spinner is a good choice. So, there it is, all the things you need to know about choosing a fidget spinner.